Linus Ullmark has been loaned to Mora IK of HockeyAllsvenskan, Sweden's second-tier professional league. Ullmark had posted a 2.58 goals against average and .891 save percentage in two starts, both losses, for Modo J20 last weekend to open the 2012-13 SuperElit season. 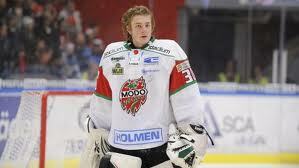 The loan comes on the heels of a injury to Mora netminder Ervins Mustukovs, who is expected to miss four to six weeks. Ullmark arrived in Mora Tuesday and served as backup to Daniel Hansen on Wednesday in a 4-1 loss to Oskarshamn. The 19-year old joins Anze Kopitar as additions to the Mora's roster over the past five days. Next up for Mora is a Saturday date with Djurgarden. Are the Sabres now average in the number of goalie prospects in the system or above average? I'd say average to slightly above at this point. Nice having Knapp, Ullmark, Lieuwen, Makarov as younger guys behind Leggio. Adding Makarov could be the cherry on top for the position that allows them to go hard after skaters in what should be a pretty stacked 2013 draft.